LOCATION Roffey Park estate is situated in the heart of the delightful Colgate village boasting country pub, church, village hall and primary school. Located approximately three miles north east of Horsham, the property is ideally situated for those needing easy access to major road networks as the M23, A264 and A24 are only a short distance away providing links to both London and the south coast. Leisure facilities including Cottesmore Country Club and Golf Course, K2 Leisure Centre and St Leonards Forest are found locally as well as some of the best schools in the south east including Millais Girls, Cottesmore School and Handcross Park Prep. PROPERTY This spacious two double bedroom apartment is located within a fine converted manor house which dates back to 1844 and was used in World War Two as a hospital for the wounded. The first floor property is accessed via a grand communal entrance hall with a sweeping staircase leading to all floors, all of which are maintained to a high standard. In excellent order throughout and retaining an abundance of character and fine views, the accommodation comprises; hallway, 20’4 x 13’4 sitting/dining room with a fireplace and views of the communal gardens. From the hallway there is access into the kitchen refitted with a range of cream units with integrated appliances. 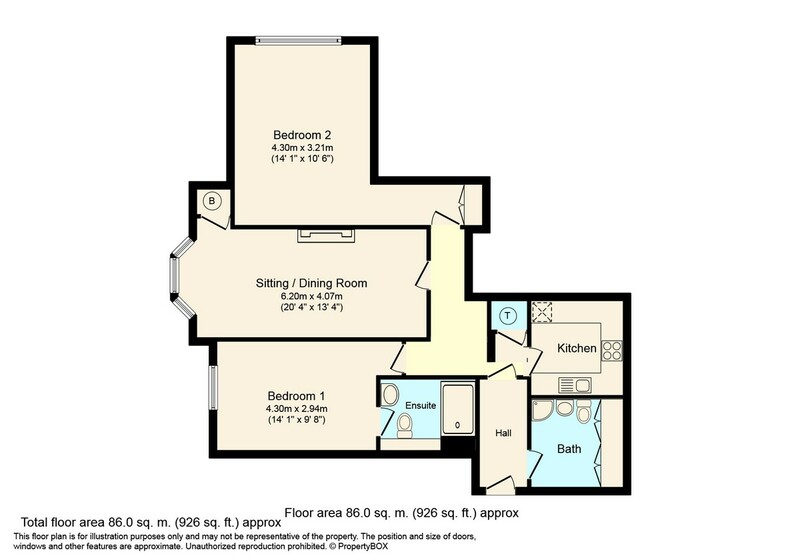 There is a 14’1 x 9’8 master bedroom with an en suite shower room, a further 14’1 x 10’6 2nd bedroom and a bathroom fitted with a white suite. Benefits include refurbished sash windows with secondary glazing and gas fired central heating to radiators. OUTSIDE Roffey Park House is approached via a long gravel drive bordering the park like grounds which extend to approximately 19 acres. Formal grass areas extend from the main house and lead to a Victorian walled garden and woodland area which has been opened up and now offers beautiful walks for the enjoyment of the residents. Two separate parking areas screened from the main house have been allocated for full use of the residents and visitors.